A tour guide at Boston's Institute of Contemporary Art broke Joe Zane’s sculpture “Tulip Head,” which was on view in the museum’s Foster Prize exhibit, by bumping into the pedestal on which it stood, according to the museum. “The accident occurred during a tour of the Foster Prize exhibition when one of our guides backed into the piece and it fell from its pedestal,” a museum spokeswoman writes. The glass sculpture, which had been stuck to the pedestal with wax, shattered on the gallery floor. “We terribly regret this happened, and of course we are compensating the artist for the lost work,” the ICA spokeswoman writes. The ICA says the sculpture (pictured at top left) was broken on Nov. 13, the day after the exhibit, which the museum promotes as “key to the ICA's efforts to nurture and recognize Boston-area artists of exceptional promise," opened to the public. 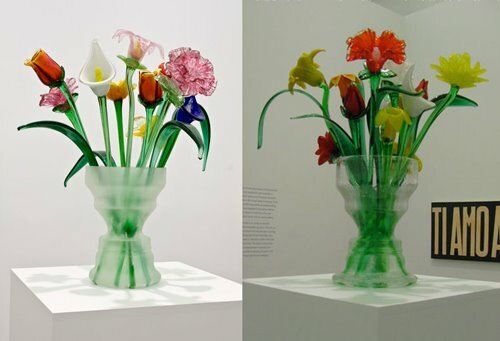 Zane had valued the original sculpture, a glass vase (its silhouette is based on the Cambridge conceptual artist’s own profile) filled with glass flowers, at $7,000. He tells me the original “took me 3 1/2 months to make,” but he was able to make a replacement “after a little over two weeks of nearly non-stop work.” He says the process of making the vase is extremely complicated and delicate. It involves creating a clay model, casting multiple molds, and then having a glass blower cast a vase from the molds. But, he says, the molds or the glass inside often fracture. To create the new sculpture (pictured top right), Zane says, “I made 4 molds. I got ONE vase.” The museum reports that the new piece has been on view since Nov. 28.